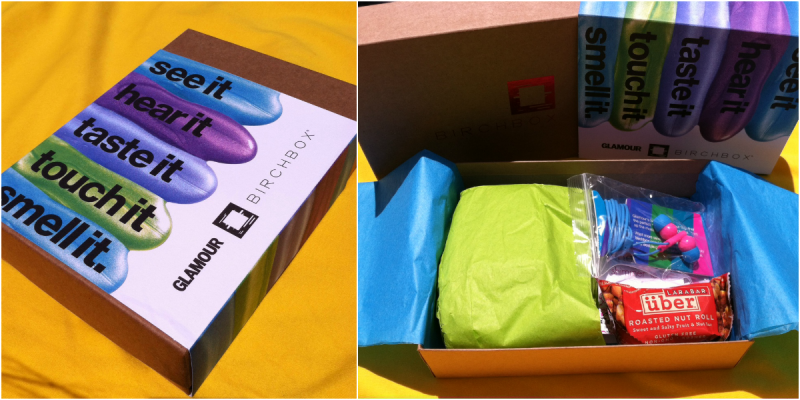 My perfectly wrapped, little pink box of goodies arrived on Saturday – yep, I’m talking about my July Birchbox! In June, my sweet husband bought me a year’s subscription to this fabulous gift. Each month a pink box arrives filled with beauty products and samples for me to try. From hair products to healthy eats, it’s such a treat to open each month. In fact, as soon as I receive confirmation that my box has shipped, I find myself counting down until it arrives. 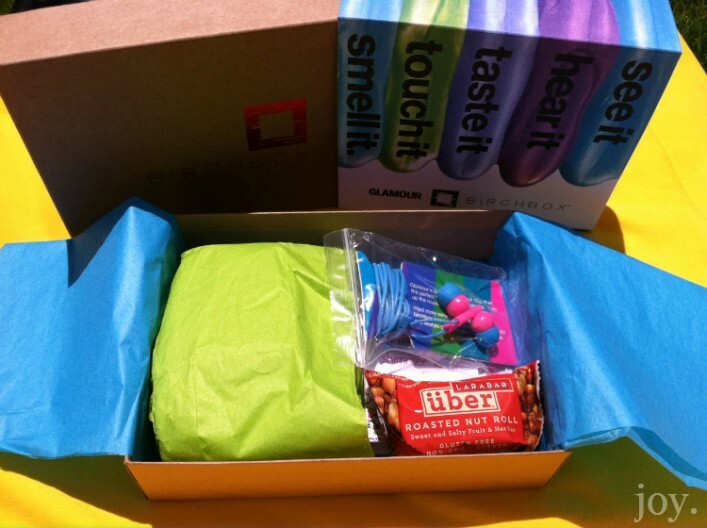 This month, Glamour magazine sponsored Birchbox to bring a multi-sensory experience to our doorstep. Birchbox never ceases to provide a pretty wrapping – which only adds to my obsession with this box, because you all know I love a good presentation. Now you must admit, that packaging + the brightly colored, tissue paper could brighten anyone’s day. Harvey Prince Eau Flirt, Lavender Pumkin, it smells great, however it’s a bit strong for my nose-buds. I’ve been trying it every so often. Suki Balancing Regimen, I’ve been trying this regimen for the past few days and overall, I really like it. The Exfoliate Foaming Cleanser is amazing, likewise is the Pure Facial Moisture oil and Concentrated Balancing Toner. In fact, the only thing that I’m not gung-ho about is the Balancing Day Lotion – which I’m convinced is drying my skin. Definitely consider buying this if you have oily/combination skin. Manna Kadar Cosmetics, sheer glo shimmer lotion, It’s light and perfect for a little shimmer glo on summer days. I’m a fan and will definitely consider purchasing this product. Color Club® Summer Pastels Collection, Blue-Ming, on my toes now… and it’s lovely. Makes me smile when I look down and have received several compliments. This Blue-Ming color must be a fave of mine, because I noticed it matches my iPhone case perfectly. LÄRABAR® über, Roasted Nut Roll, I will say it was a good snack – healthy and delicious. However, I don’t think I’d actually purchase a box of these special bars. I’m more of a Clif Bar or Nature Valley kind of gal. Birchbox Exclusive Earbuds, and summer playlist! I love this. It was such a sweet surprise and the colors are ideal for any lady. Are you a fellow, Birchbox subscriber? I’d love to hear what you think about July’s goodies. If you aren’t, sign up here as my referral! 17 Jul ’12 Filed under A Few of My Favorite Things. Tagged beauty, birchbox, health, products, skin, style. Bookmark the permalink. Post a comment. Leave a Trackback (URL).